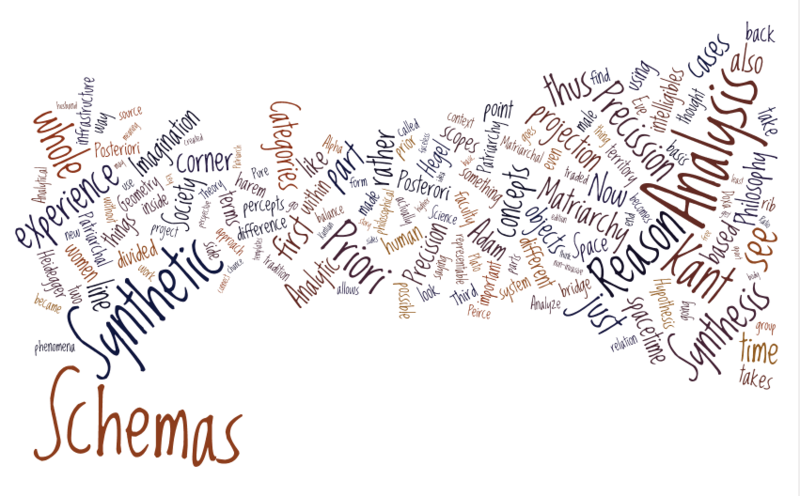 Telescoping Text Experiment: Listen to my story! Please pay respect to the voices that scream in the remembered forms thatopen out beyond us only then to the finally loved and lost secrets of oblivion with the orphans of the that fastness just beyond the overtuning of the starsthat have sang at me of your signs and abase and remain blind if you will not behold our minute reflective beads of being running above the stolendarkness beyond the edgelessness of the pluriverse. See this brilliant new art form and the modern equivalent of the sonnet. Quora answer: What is the difference between design thinking and analytical thinking? 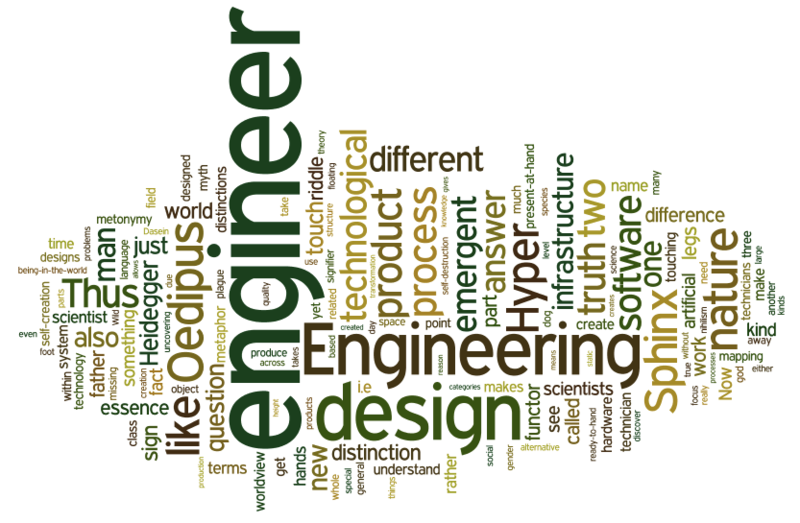 Quora Answer: What is the best generalization statement about engineers? G+ answer: How far has artificial intelligence advanced – are any machines close to being “self-aware”? I think there is a lot of misunderstanding of AI both in Academia within the AI community and also among the public. I discovered something about AI in the 90s that I think is relevant to this question. I was considering the ontological basis of Software, and I finally understood that it has the nature of Hyper Being, which Derrida calls DifferAnce (differing and deferring). Once that was clear, then it became clear that the nature of AI had to be Wild Being (nb. Merleau-Ponty) and actually explored by Deleuze among others. So to make this concrete we can say that if Software is the only artifact with the nature of Hyper Being (what Plato called the Third Kind of Being in the Timaeus, cf J. Sallis) then the entire purpose of Software Engineering is to contain, the unpredictability, non-representability of Hyper Being which from the beginning was recognized to be a problem and thus the Software Engineering Institute and other consortia were set up to try to come up with solutions to this problem. But if the software could not be tamed then it was driven off to the outback of AI research. And what I noticed about the various AI techniques was that they were all opaque to us, and so when they are combined they become even more intensely opaque to our understanding. This is directly opposite our own cognitive capacities which to us seem transparent, even if the actual functioning of the brain is opaque. So this means that when we say that AI systems are going to be self-aware then we are projecting our own ideas on them as to what intelligence is. It seems to me that if in us our consciousness is transparent and brain functioning that supports that is opaque, then perhaps since these machines are our inversion, then perhaps for them the unconscious, i.e. 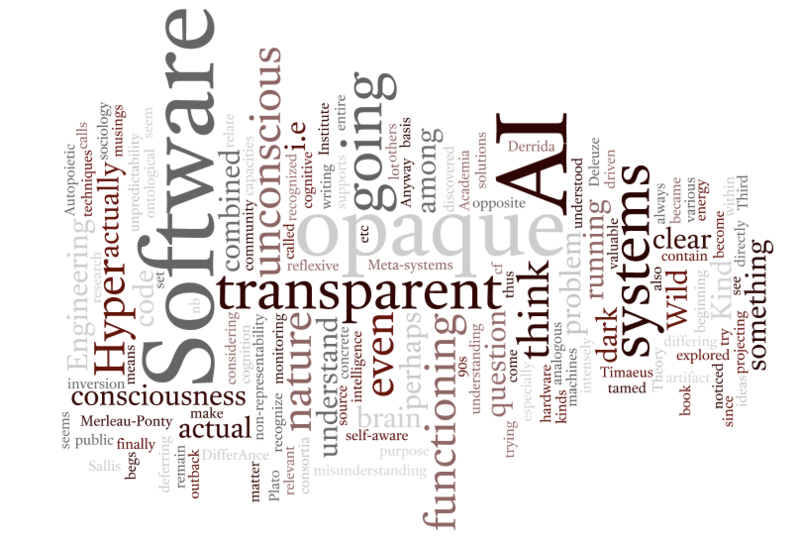 the code itself running is transparent, but the actual functioning of cognition is and will always remain opaque. So that begs the question of how we are going to relate to opaque consciousness, or even recognize it? It is going to be something analogous to dark energy or dark matter, and our own unconscious. While the unconscious of the systems, i.e. the software running on the hardware is going to be transparent to us, because we will understand its code, and will actually be writing it, and monitoring it, etc. 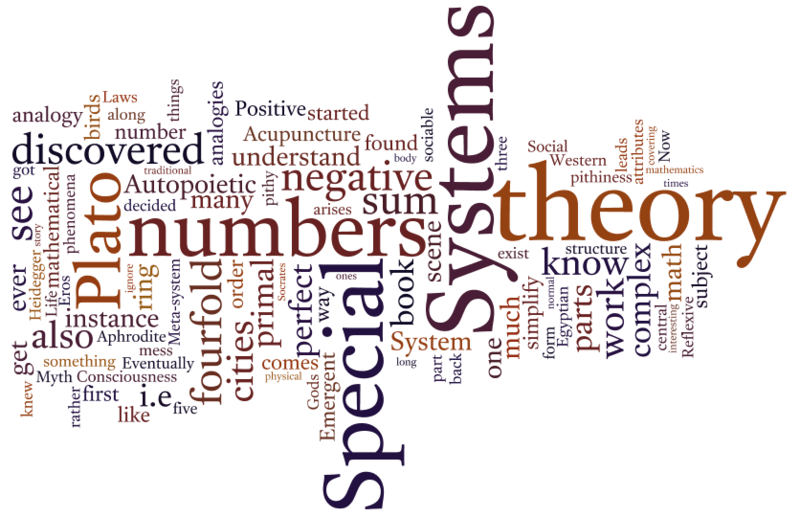 I think Autopoietic Systems Theory is valuable in trying to understand these kinds of systems, especially when it is combined with some kind of reflexive sociology. Anyway you can see the source of these musings at http://works.bepress.com/kent_palmer in my book Wild Software Meta-systems. It is pretty complex. But I suggest you search for the terms I mentioned, it is somewhere toward the front, and it has to do with gestalt/flow and the other permutations I mentioned. Basically it says that Ideas and Emotions are reifications of thoughts and feelings that can be transmitted culturally, and it gives a criteria for distinguish what you call sentiment from the memes. I don’t subscribe to the concept of Meme actually but that is another discussion. Ok. Here we go.y Hope you are prepared for some complexity in the argument. I will try to keep it as glib as possible. With these short posts it is going to be a challenge. Trying to be as succinct as possible, and probably ending up being cryptic . . . Systems are Gestalts. Gestalts are made of figure and ground. The dual of the gestalt is the flow. A flow is made up of a reference and a stream. The duality of the figure and ground within the gestalt inverts the stream and the reference. So the figure is like the reference and the stream is like the background. Difference is that the stream flows in front of the reference and the figure is in front of the background. This duality is not generally recognized in the literature. 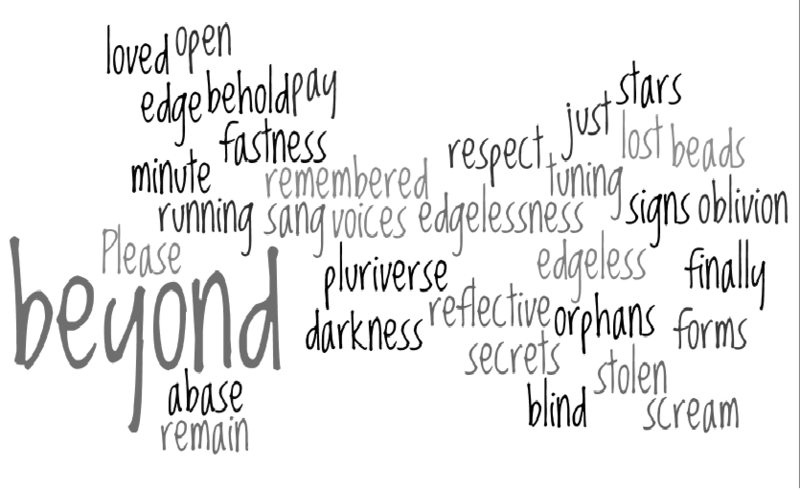 I have only found one or two references to temporal gestalts in the literature. But the idea at least goes back to G.H. Mead and his idea that each thing has its own amount of time it takes to be what it is. This is the cycle time of the eventity. Now, this is at the perceptual level, but at the conceptual level this difference is the difference between Process and System. 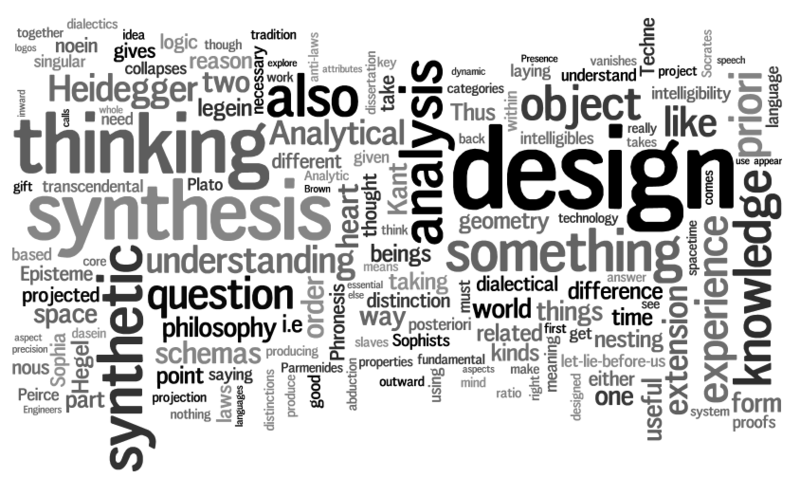 Rescher has called for the revitalization of Process Philosophy, and its connection to Systems Theory, which has not happened in the literature as yet. J. Seibt his student has made a start on this project. I suggest this disconnect is a blindspot in our academic (logos) and industrial (physis) culture. 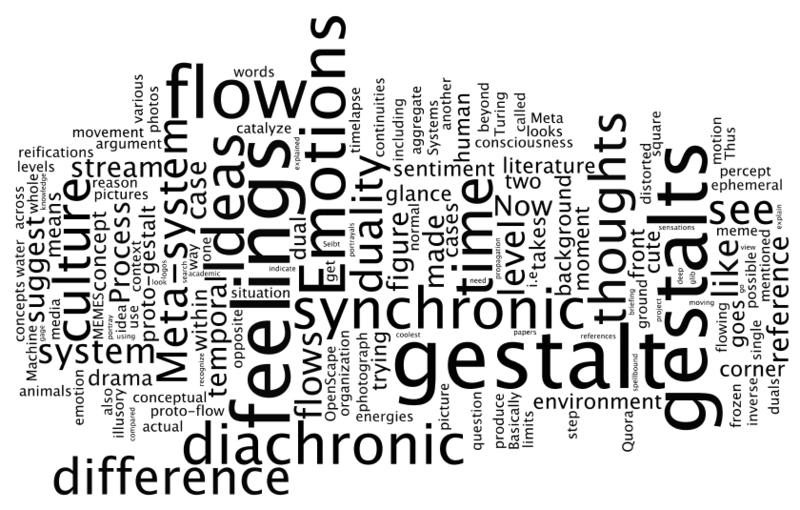 Gestalt=flow and system=process are duals at the percept and concept levels. Now that we have established this deeper duality which we will not explain here except to say that the reason it is called the proto-gestalt is that it is what controls the glance that forms a single gestalt. When we look around the square in a foreign city we take it all in with a glance which contains within it actual looks at various gestalts on within the scene. Thus gestalts always have the context of the glance which is constantly moving and has is own implicate order (Bohm) and tacit knowledge (Polanyi) of the surroundings that it uses to gage the situation in the square as we step into it from a sides treet. This context or situation, or ecosystem, or environment, or media, etc (OpenScape) comes before the actual gestalt or flow. This is why we use the word proto-gestalt or proto-flow at the level of percepts to indicate the difference that at the conceptual level is between the Meta-system and the Meta-process. Now we get to the crux of the matter. There is another determination that we need to explore, which is the relation between Gestalt and Flow to Diachronic and Synchronic. Diachronic means in the flow of time and Synchronic means a slice across time in a moment. A diachronic gestalt is a temporal gestalt as we have said, while a normal gestalt is taken in at a single moment. Of course a moment takes time as Wm. James points out in his argument about the Specious Present. So Gestalts can occur across time in a larger interval as we see in a piece of music which takes the entire time of hearing to get the whole picture of its “movements”. Now if there are temporal gestalts or diachronic as well as synchronic gestalts, then there must be synchronic flows that are the inverse dual of the diachronic gestalts. We are familiar with these from photography. They are the pictures where the water is flowing during a “timelapse” so we see all the water flowing as a whole mass, which looks blurry in the photograph. Synchronic Flows are like “stop motion” pictures where the individual raindrops are frozen in midair. A normal motion picture is the case of the temporal flow that is diachronic So there is also the case also of the synchronic flow, and a photograph is the analog of the gestalt. So our main media are photographs and videos these days digital. But there are the corner cases of diachronic gestalt (timelapse) and synchronic flow (stop-motion) that set the limits for the inversion of these two duals into each other. that are normally distorted by trauma. The ideas and emotions are externalizations that we use to produce culture, because thoughts and feelings are two ephemeral for that work. They are reifications, and limits of human reason and the very stuff of appearances that fit into Plato’s divided line. Do conversations inhibit meme propagation because they aggregate sentiment rather than catalyze it’s movement? Is that why there are so few cute cat photos shared on Namesake? Now I am not sure what you mean by “aggregate sentiment” and “catalyze movement” but this reminded me of the difference between Emotion and feelings. Emotions are aggregated feelings, and feelings are catalyzed by portrayals of emotion say in drama. What does it say about us as human animals that we can ask “What is the coolest looking animal on earth?” in a time of global species devastation due to human interventions in the environment? http://www.quora.com/What-does-it-say-about-us-as-human-animals-that-we-can-ask-What-is-the-coolest-looking-animal-on-earth-in-a-time-of-global-species-devastation-due-to-human-interventions-in-the-environment where I make the case that our fascination with cute little animals or strange ones says more about us than it does about them. But we can say that each of us is trying one way or the other to portray ideas and emotions that reflect our thoughts and feelings to some level of fidelity unless we are sociopaths. Some are better than others at this process, and the best are novelists, playwrights, directors of film, painters, and other artists, i.e. manufacturers of culture. This reminds me of DUNE more than Arabia. But interestingly enough the Saudis just erected a gigantic clock over the Kaba at Mekka, and thus somehow this experiment is apropos of that development, as my son says everyone will think Muslims are praying to a clock. The new clock is kitsch, full of LEDs that shine out across the desert, and it is now the second tallest building in the world. So what led to that obsession with time, that would cause the Arabs to raise time over the Kaaba to such a height. In your image it is 5pm, which is just after Asr before Magrib. Magrib is the end of the day. After Asr there are no more prayers. So we could lend this an interpretation, which I am sure you did not intend that we are in the end times, when there is no more real Islam because there is no prayer, instead there is only the inability to do the prayer between Asr and Maghrib. Maghrib is the end and also the beginning of a new day. Quora answer: What did Jean-Paul Sartre mean when he introduced the topics of existence and essence? I have discussed this in other answers I have given here, so see some of my other posts. But it is an excellent question, and some answers bear repeating for the sake of clarification. As I have said elsewhere to be briefly touched upon here. Being only exists in indo-european languages, and existence came into our lexicon as we translated Arabic texts on Aristotle back into Latin. We had to create a technical term for wajud in Arabic and so we produced existence, which means exi-stance, to stand outside of, and also ecstasy. Wajud really means what is found. Existence is what stands outside of Being, prior to the manifestation of Being, but also manifests under the veil of illusions that are created by Being. Heidegger, used the idea of ecstasy to say that dasein is the one who projects Being as a being-in-the-world as an ecstasy, thus dasein throws Being into being as becoming yet at the same time is thrown into the world. Generally it is thought that Sartre got Heidegger wrong and his thought has been devalued recently by critics, as a bad imitation, and thus Critique of Dialectical Reason is considered his greater work in terms of originality, even though his most popular work was and probably still is Being and Nothingness. Merleau-Ponty saw nothingness as being the inverse dual of Process Being (ready-to-hand modality of Being). Thus he calls the third meta-level of Being the Hyper-dialectic between Being and Nothingness which I shorten to Hyper Being and which Derrida called Differance (differing and deferring) and which Heidegger called -B-e-i-n-g- (crossed out). However, we can see that Sartre was reconsidering Heidegger in a Hegelian context. And if we note that Heidegger begins and ends Being and Time with references to Hegel, and that Heidegger uses the term dasein, which for Hegel in his Logic was determinate being, and the german philosophical term for “existence”, then perhaps this critical view perhaps needs to be reassessed. As I have elaborated elsewhere, the concern for existence was an undercurrent of philosophy since the Renaissance. Essence concerns Being as it manifests as kinds of things. Existence concerns what is found. Eventually existentialists realized it could be used as a way to reverse things within Western Metaphysics to say that Existence precedes Essence, rather than the other way around which is basically an idealist approach to things which is endemic to our worldview. Existence points toward the concrete manifestation of singular individuals that are found, rather than to their constituent attributes and the constraint ranges on them which determine their species or kind. For instance Maturana and Varella’s Autopoietic theory is existential biology because they concentrate on the viability of the individual organism, rather than their connection to a species as an exemplar. The move toward existence as an important concept appears in Dostoevsky, Kierkegaard, Heidegger, Merleau-Ponty and others following in their footsteps. Sartre played an important role in the development of Existentialism, and by his formulation of it as existence preceding essence, rather than what is normally believed which is that they are another way around. This is also seen as supporting the Marxist position that material things are important, without being quite as crass in its explication. But in both Heidegger and Sartre, they do not achieve Existence as is mean originally by the term wajud. Neither actually escape Being, they merely manage to go up a meta-level to the next higher stage of Being. Sarte shows this in his terminology taken from Hegel of being-for-itself, being-in-itself, and being-in-and-for-itself. Heidegger shows that because the ecstasy of dasien can be seen as a form of becoming. For them Being is essentially Being taken to its limits, not beyond its limits to a new standing. The development of Existence as a mode for critiquing Being, in terms of Process Being and which considers Pure Being to be identical with essences was a big advance in metaphysics, and it goes back to the distinction in Husserl between Abstraction (Pure Being) and essence perception (Process Being). Note essence perceptions which is a transformative operation produces representations of essences which are constraints on attributes of a thing. Those representations are presented in Pure Being. So there is a circle here of representation which is repeated. Heidegger talks about this in relation to the fact that Dasein is within the world he projected ecstatically. A fundamental contradiction of the order of the idea of Christ who is God in the world that God as Father created to whom the Holy Spirit came who is by the way also God. Heidegger does not talk about essences because he says that these belong to entities other than Dasein to which the Categories of Kant apply. But instead we need to recognize the existentalia which are the same as the categories for humans of which there are three (verstehen, rede, befindlichkeit). That is understanding, talk and foundness whose overlapping give us Care. Sartre is coming to the whole issue from a Marxist perspective, and thus for him existentialism is the new way to understand the materialism of Marx from a psychological perspective. Marx himself did not question the preeminence of essence over existence, because existence was not on the radar. Material things were thought to have essences. Existentialism made materialism into a psychological state and explained some of the problems of Marxist ideology which was normally thought about in very mechanistic ways. Existentialism was the way that things looked from the point of view of the individual. And it meant a difference in the way the individual fit into the world related to its absolute freedom, because the individual made the world, he made the meaning of his world, and therefore he made himself. 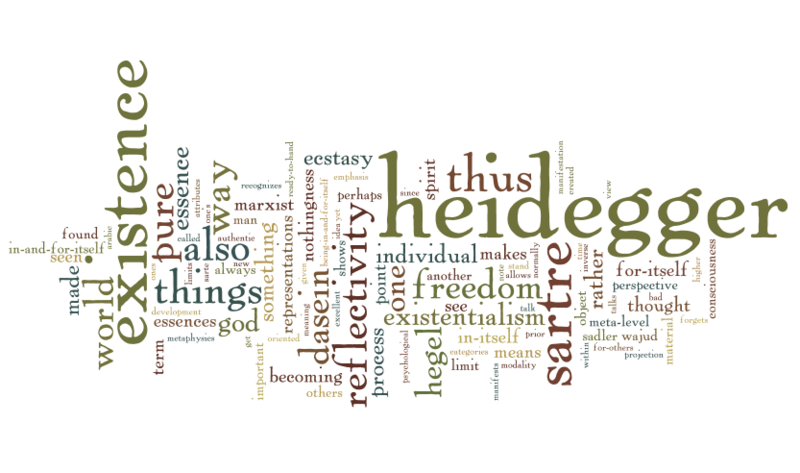 Existentialism of both Sartre and Heidegger was very individually oriented. An excellent book that makes this point is Existence and Love by Wm. Sadler. Sadler makes the point that phenomenology is very visually oriented and this makes it concentrate on the individual’s experience, whereas if the major mode of the senses was auditory then the problem of intersubjectivity that plagued Husserl and that Heidegger set out to solve would not have existed, because sounds interpenetrate and are not seen as something distant and separate. The fact that existentialism concentrates on the individual as something perceived, something under the gaze as the other, means that it always turns out to be rather bleak, as we see in Camus, or for instance in Sarte’s waiting room where Hell is other people. By using Sadler we can get a handle on what Heidegger and Sarte have in common as a fundamental assumption. Sartre is basically reversing Heidegger and looking at Nothingness as the active groundlessness of consciousness itself. This is the inverse dual of Heidegger’s Process Being (ready-to-hand, grasping) which is a modality of the Monolith of Being just as is Pure Being (present-at-hand, pointing). Being is also groundless for Heidegger and that shows up in its endless becoming, but that becoming leads to the projection of representations that are present-at-hand, i.e. that we can point at. But for Sartre consciousness is groundless in a way that it is always involuting and thus falling into nothingness, so nothing can stand in consciousness for very long, and thus we must produce what ever meaning we can appeal to ourselves. For Heidegger Being is itself intelligibility, and as Parmenides says “Being and thinking are the same”, and thus the process of projection is itself positive in that it produces though transformations and processes the static representations as products. Sartre on the other hand recognizes something that Heidegger misses. Heidegger posits dasein as what is prior to the subject/object dichotomy. But Heidegger more or less forgets about the object, which we might call the eject, i.e. the proto-object, perhaps something like the placenta that comes into being with dasein yet is not either an object nor a subject. Sartre adopts the vocabulary of Hegel and talks about in-itself, and for-itself. Thus there are the things that are not seen as part of the ego which are in-themselves, and these are different from what the ego recognizes in the moment which is for-itself which is pure freedom and pure reflectivity. There is also being-for-others which is always a temptation. And finally there is the pure freedom of God for which man strives but which is the reflectivity of reflectivity which is being-in-and-for-itself. Thus man can get lost in material things (in-itself), in others (for-others, which Heidegger calls mitsein) and in the in-and-for-itself of the reflectivity of reflectivity of God which is an unsustainable limit. Man is only truly himself if he has the practical freedom of the in-itself which is reflective and which allows him to see himself in the world as its maker, and also as the made, by his own actions. In Heidegger, the emphasis is not on reflectivity, but on the ecstasy of dasein pouring forth Being from the inside, which then allows him, to be-in-the-world that is spun from out of him. In Sartre the emphasis is on reflectivity, which is Hegelian self-consciousness (for-itself) and there is a limit in the Absolute of squared reflectivity which reminds us of pure Spirit that is in-and-for-itself. Sartre’s for-others (mitsein) is collapsed into Spirit in Hegel. Spirit is the Social polis pursuing is historical destiny. Since Hegel is an idealist for him the in-itself does not really exist completely, but that is exactly what makes the Marxist reversal of Hegel possible. But Marxism in its pure form causes Nausea because it means the things of the world are too much with us. When one denies one’s freedom and acts as if one is an object that is bad faith for Sartre, a lack of authenticity in which one forgets the for-itself and its freedom given through reflectivity. One can also be inauthentic by living for others, and trying tobe what they want you to be instead of being yourself and exercising one’s inherent freedom. One can also think of oneself as god and believe that one can remake everything in ones own image and thus be caught in the in-and-for-itself the limit of human existence at the higher meta-level. So for Sartre the only way to be authentic is to avoid these three pitfalls and realize ones being-for-itself and realizable freedom to be authentic.